Normally if you find a young bird, you should contact a local wildlife rehabilitator. Starlings, as well as house sparrows, are exceptions to this rule. These birds are considered invasive, or non-native, species, and do not fall under the same rules as native birds. Most wildlife rehabilitators probably would decline to care for a fledgling starling, because it is considered an invasive species. This also means that anyone can care for an abandoned starling without breaking any laws. Fledgling starlings require food that is high in protein. Commercially available food for domesticated birds, such as parrots, will not have a high enough protein content to keep the starling strong and healthy. You can make your own food with one of many recipes available on the Internet. Most start with a base of high quality cat food. Select a cat food that has a protein level of at least 32 percent, as well as a fat level of at least 9 percent. Chicken should be the first ingredient on the label. Soak one cup of cat food in enough water so that it is soft but still holds its shape. Add one-quarter cup of applesauce and one finely chopped hard boiled egg. Stir in 750 milligrams of calcium, using a source such as over the counter chewable heartburn tablets. Top with avian vitamins, available at most pet stores. Divide the food into smaller servings and freeze. Don't leave the food at room temperature for longer than an hour or it may spoil. Scoop a small amount of food onto the end of a coffee stirrer, chopstick or straw that has had the end cut off to form a spoon. Ideally, your fledgling will open his mouth when the food gets nearby. It may take him a few sessions to associate your hand and the feeding implement with food, but he will catch on quickly. 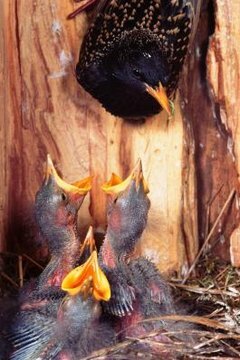 When hungry, fledglings will open their mouth, which is called gaping. Drop the food onto his bottom beak when he does this, and he will swallow the food. Feed him until he quits gaping, he will stop when he has had enough, you don't need to worry about overfeeding him. Feed him every hour or two during the day. He will sleep from dusk to dawn, and doesn't need to eat during this time. Once you and your fledgling are comfortable at mealtimes, you may want to add a little something different to his food. Maintain the same base formula, but stir in additional foods so he becomes accustomed to various flavors. You can add a spoonful of any jarred fruit, vegetable or strained meat baby food, as well as raw, unsalted sunflower seeds, raisins, rolled oats or chopped apples. Once your fledgling is eating well, you can start to transition him to feeding himself. Start by putting a container of his food in his cage while you feed him, feeding him directly from the dish. Take your time while feeding him. He will get curious and start pecking at the food when he sees you refilling his feeding utensil. He gradually will start taking more of his nourishment from self feeding and start depending on you less. This is also the perfect time to add a small bowl of water to his cage.